Moose Tracks... 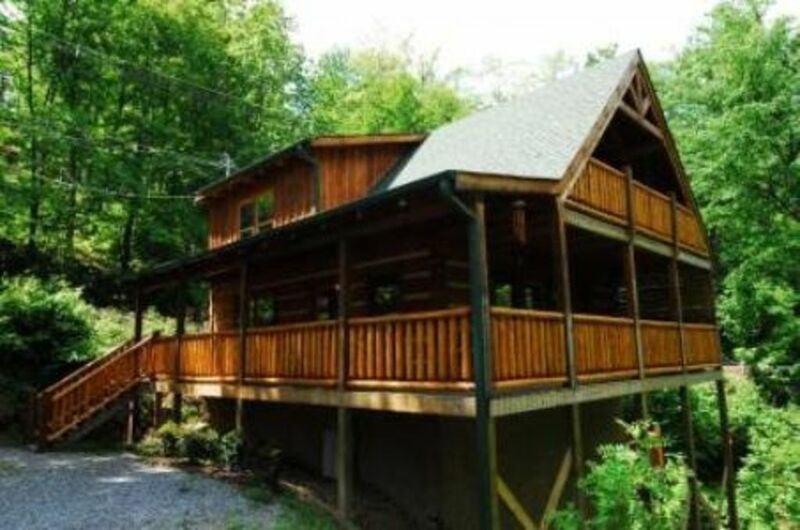 Ideal log cabin for your Gatlinburg honeymoon in Tn or just a romantic Gatlinburg mountain getaway that you will want to return to time and time again. This luxury log cabins mountain theme includes 3 levels of luxury and entertainment for your romantic Gatlinburg mountain getaway. The main level boasts a comfortable living area with cathedral ceilings, exposed beams, a gas log fireplace and a huge wrap around deck with hot tub that enjoys beautiful views of the Smokies. The over sized master suite is perfect for your Gatlinburg honeymoon or romantic Gatlinburg mountain getaway. It encompasses the entire upper level with its own bath, computer desk and catwalk to private covered balcony that enjoys the view. The lower level includes the rec. room with pool table and a dry sauna and shower, sitting area and another outdoor balcony. In addition to 2 full baths, there is a slate shower on the lower level that you will enjoy when coming out of the sauna. Winter months may require 4 wheel drive and/or snow chains. Roads are all paved and well maintained, but they are mountain roads. Travel insurance is a available at booking for an addtional fee and it does cover inclement weather. We were only there for 2 nights, but the cabin was clean and comfy! It was a mini honeymoon before we go to Jamaica and it was wonderful! I will definitely stay there again! Absolutely loved the pool table and hot tub! The cabin was peaceful and relaxing. Close enough to the city but not to close. Great location, nice cabin, exactly as advertised. We walked in and were STUNNED by your cabin! Everything was so clean and well stocked with amenities. The spaces were much larger than we expected and the bed was very comfortable. The hot tub was already on and hot when we arrived. The views were stunning, especially as the sun set. We will absolutely recommend this place to anyone coming to Gatlinburg and I’m sure we will be back ourselves! Thank you! We are so glad you enjoyed your stay in our cabin and we look forward to your next visit! perfect spot for visit to the Smokies! Great location, beautiful views and lovely place. We would definitely return!! The privacy was awesome! Very relaxing. Beautiful cabin. Located in prestigious Chalet Village and surrounded by the beauty of the Great Smoky Mountain National Park. Club house access with pools and tennis courts. Just minutes to downtown Gatlinburg, the Ober Gatlinburg Ski Resort, Action Packed Pigeon Forge and Dollywood. No arrivals or departures on Thanksgiving Day, Christmas Eve or Christmas Day Roads are paved and well maintained however they are mountain roads and in the event of snow you will need a 4 wheel drive.